Founded on September 25th 1965, Landvélar Ltd. started out as a service company supplying the agricultural sector but over the years our core focus has shifted to servicing industrial and commercial life in Iceland in its widest form. Most of the country’s manufacturing and industrial companies are among our customers. Fisheries and the fish processing industry, workshops of all sizes, all heavy industry, energy companies and numerous contractors and innovation companies. Offering as we have always done, a range of valuable services to farmers and various small businesses and self-employed professionals. We work in a challenging market where good service complemented by the specialist knowledge of our employees is the cornerstone of our operation and has built Landvélar’s deserved reputation as a reliable company servicing the Icelandic industrial and fisheries sectors. Our product range is extensive, however our core activities are, on the one hand, service and consultancy for pneumatic and hydraulic fluid-driven, high and low pressure transmission and control systems, and on the other hand, consultancy and advice regarding the sale of tools, welding and other equipment for professionals and, machine workshops. It is well known that Landvélar are experts in the construction, crimping and assembly of high-pressure hoses and pipes. Decades of experience contribute to this reputation strengthened by our emphasis on fast service and an extensive selection of products. The expression „Landvélar will take care of the problem“ is widely used and we are proud of it. We design, draw and build high-pressure hydraulic systems, power plant stations and related equipment. Each project is a challenge and in partnership with leading manufacturers, we have acquired extensive experience and knowledge of hydraulic fluid-driven, high and low pressure systems. Good service is always supported by excellent products and specialist knowledge. Landvélar has a large number of partners worldwide and we pride ourselves on them being leaders in their field. Amongst them are globally leading companies like Bosch Rexroth, Parker, SKF, Dunlop Hiflex, Hansa Flex, Merlett, Kemppi, Elga and ABUS. Landvélar is an authorized sales and service provider for SKF transmission systems, bearings, gaskets and lubrication systems. We focus on preventative maintenance and service alongside the design and installation of automatic lubrication systems and the condition analysis of bearings and transmission systems, vibration measurements etc. SKF also offer a variety of specialized tools for bearings and transmission systems. As agents for Kemppi and Elga we provide advice and service relating to all welding equipment, welding machines and consumables together with the appropriate safety and cleaning equipment. We also offer a wide range of specialised tools for the metalworking industry such as lathes, polishing machines, drills and saws, as well as high-quality hand tools from Kamasa. In recent years, we have systematically developed our sales and professional knowledge of water, chemical, and rotary drum pumps, along with high pressure pumps and accessories for all types of pumping equipment. Today we offer complete solutions for industry, fisheries, contractors, home and summer cottages. The cornerstone of our operation is a well equipped service workshop, specialized in the maintenance of hydraulic pumps and motors and also in the construction of hydraulic power packs and control valves. In addition, we bend, angle and custom build high-pressure pipes and nozzles etc. 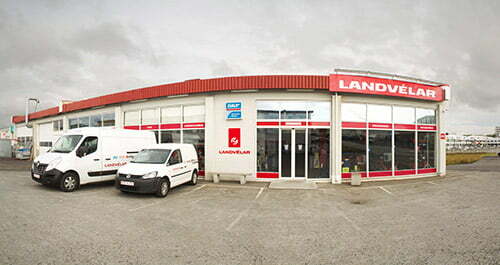 Landvélar has always placed great emphasis on close cooperation with machine workshops and other service providers. The result is a dynamic network of service partners around the country providing the appropriate specialised equipment and resources for pipe and hose construction accessible to the home market quickly and easily. Landvélar’s subsidiary in Akureyri, Straumrás Ltd. is a well-established company, deep-rooted in its home market and enjoying the benefits of close proximity to the dynamic industrial and fisheries sectors in the northern region. Straumrás Ltd. is located at Furuvellir 3 in Akureyri.